Craig and Annette Anderson purchased the business on April 1st 2011 with the goal to enrich the Greater Corvallis Community with quality sewing and vacuum products, and the highest level of customer service. We are hon­ored to bring over 20 years of ex­per­i­ence to this com­mu­ni­ty as the new ow­ners of Corvallis Sewing and Vacuum Center. We look for­ward to bring­ing a re­newed em­pha­sis in cus­to­mer ser­vice and pro­duct know­ledge, along with the fi­nest pro­ducts in the in­dus­try. Corvallis Sewing & Vacuum from Corvallis Sewing & Vacuum on Vimeo. Jerry is our in house expert when it comes to fixing or fine tuning your investment. He has been factory trained, attends continuing education workshops and has been in the industry over 15 years. We consider Jerry the most finely skilled Technician in this valley! Something about Jerry you may not know....he is in the Army Reserve. Way to go Jerry, we're proud of you and appreciate that you serve us in this capacity! Marcia is an awesome part of our capable staff. She keeps all of our special orders straight and is interested in seeing each of your projects. Marcia owns a 41-year old Bernina sewing machine, a Brother Sewing Machine, a Serger, a ScanNCut and a Miele vacuum (!) which gives her the experience you need to make an informed decision. Marcia also teaches our sewing machine owner education classes. Marcia loves to inspire people to sew and not be afraid to try new projects. A surprising fact about Marcia that you may not know.....Marcia has travelled to China twice with a friend who was adopting a new child each visit. Always quick to help and truly the wittiest one of the bunch, Lisa has been a great addition to our fabulous staff. Her beauty, brains and brawn are a tough act to follow! Lisa owns a Miele (she uses it EVERY day!) and a Viking Sewing Machine. She has taken and observed our classes, is knowledgeable about our great products and is truly capable of helping you with a smile and a laugh or two! A surprising fact about Lisa that you may not know....she loves Dutch Brothers....ALOT! Barb is the Queen of the Dream Machine and all that is FTC-U. She has tirelessly taught our Embroidery classes and kept us informed of the Brother Updates (which are FREE). Sadly she is on a teaching hiatus~although we are hoping for some cameo teaching appearances! Barb is on her 2nd Dream machine (her previous Dream Machine had over 21 million (Yes, that's MILLION) stitches on it) and she was Craig's first "Dream" sale! A surprising fact about Barb that you may not know....she and her husband, Dave, like to buy properties and fix them up to rent or sell. They are fantastic at it! Sign up for an Embroidery class and you, too, will learn how amazing Barb is and what an excellent asset to our team she is. Denise came to us as the ScanNCut Expert and began teaching our SNC classes but we have found that her talents go far beyond that! She also teaches our FTC-U Software classes as well as being our Dream Machine/Dream Club expert. Denise has sewn all of her life and can answer any sewing question you may have. Denise is always on a quest to learn and has become very familiar with all of our machines as well as the software that goes with them. She has an incredible talent for listening, bakes the best cookies (attend her class & you will get to eat one) and is a true gem to work with. Denise currently owns a ScanNCut, The Dream Machine and a Miele vacuum. These qualify her to help you with your machine questions and ultimate purchase. A surprising fact about that Denise you may not know....she is an advocate for Senior Dog Rescue and owns 2-Senior Doxies. Sign up for one of Denise's classes and you, too, can witness her fun, bubbly charm and personality! Rachelle joined us after purchasing a ScanNCut, a Dream Machine and attending one of our events. She has become a fun addition to our staff with her energy and enthusiasm. Rachelle maintains our website to the best of her ability as well as our email campaigns. This has been a fun "job" for her after spending 30 years working for a large corporation. Rachelle has been able to fill in teaching embroidery classes when help is needed and co-teaches our ScanNCut class. Besides her Brother machines, she also owns a Miele vacuum and is available to answer any questions you may have about our quality products. A surprising fact about Rachelle you may not know....she has a knack for home decorating and had her own business helping others with their decorating needs. Stop in or sign up for one of her classes. She'd love to meet you! Gail came to us as a Beginning Quilting Teacher and has expanded her class line to include table runners, pot holders...pretty much anything you can dream up! She has been quilting for about 12 years, although only SERIOUSLY quilting since retiring in 2014. Gail is a member and current Treasurer of the Newport Quilt Guild, she is a retired bookkeeper and even taught High School PE and Health. A surprising fact about Gail you may not know....she and two of her brothers share the same birthday (however she holds steady at 49 as they age!). Sign up for a class with Gail. You will learn some excellent quilting techniques that will give you a "base" for moving forward with your own projects. Deanna learned to sew garments from her mom and had a knack for picking a new pattern and fabric on a Saturday morning and REALLY wanting to wear it for school on Monday. Thanks to Mom, that wish came true often. She learned to quilt from her mother in law and has created dozens of quilts since. She’s the newest member of our team. She sews on a Brother Dream Creator and is looking forward to sharing skills with and learning from the fantastic folks at Corvallis Sew and Vac. An interesting fact you may not know about Deanna - she’s traveled to 18 countries while serving in the Navy for 22 years. Thank you for your service, Deanna! Sign up for Deanna's classes. She is fun, enthusiastic and willing to share her awesome talents. 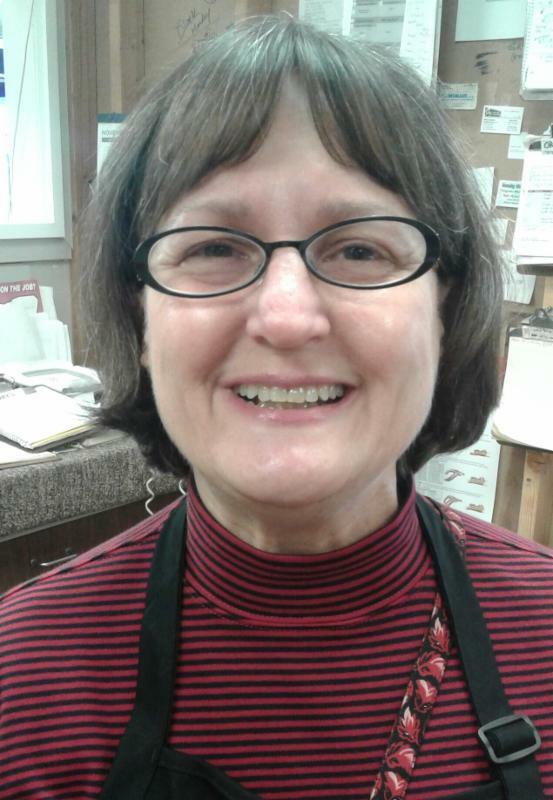 Kathy began with us as a customer and has blossomed into teaching, we're so glad to have her. She likes the involved embroidery classes that Hoop Sisters offers and is willing to lend her expertise to you. An interesting fact about Kathy you may not know....she had her own Long Arm business in a shop at her home. Sign up for Kathy's classes, you will certainly be glad you did! Jessie has evolved from being a customer (yep, she bought a Dream Machine!) to sales help to teaching. She has years of sewing and embroidery experience and is also involved with Quilts for Caring Hands. Thank you, Jessie! An interesting fact about Jessie you may not know....she and her husband used to live and travel full time in their RV. We're sure glad you decided to make Corvallis your home! 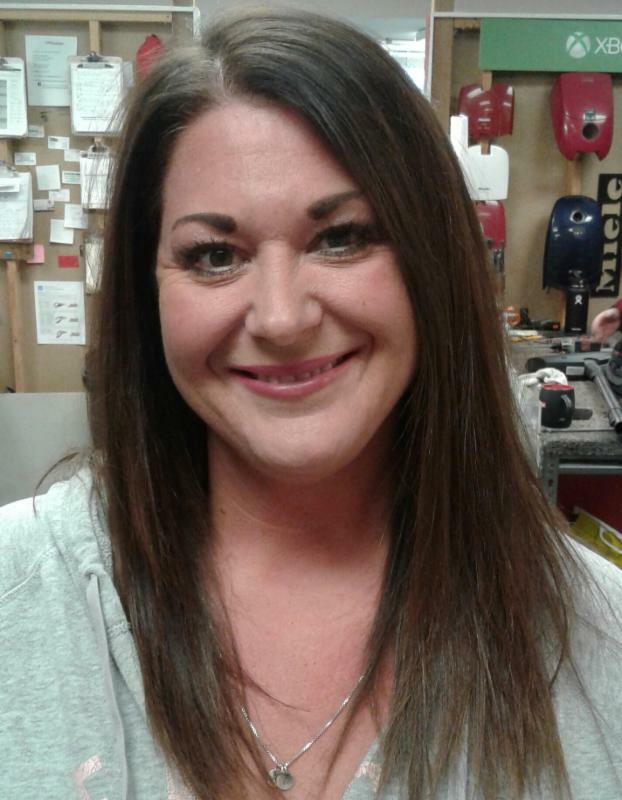 Visit Jessie in the store or sign up for one of her classes, she would be happy to share her knowledge with you!